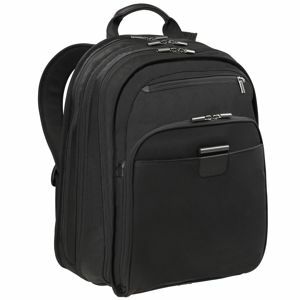 This backpack has a large 4 section design: (a) SpeedThru™, (b) computer, (c) organizer and (d) file section. The SpeedThru™ section unzips allowing the brief to open like a book. In the open position the laptop may be left in the computer compartment during security screenings, reducing risk of damage or loss. The front organizer section can house a PDA, cell phone, business cards, USBs, CDs, cords, pens, keys and all other business essentials. Checkpoint friendly computer compartment is padded for maximum laptop protection Holds a 17" Laptop. On the Outside, the SpeedThru™ design allows the laptop to remain in the sleeve during security screenings, providing protection against damage and theft. There's an aerated mesh back padding that allows air to circulate against body, keeping back cool. The slip through back pocket allows the sleeve to slide down the handle of any wheeled piece of luggage. Lightweight and durable 1680 ballistic nylon outer fabric resist wear, water, dirt and abrasions. There's self-repairing, durable YKK® racquet coil zippers with ergonomic zipper pulls for easy opening and closing. Webbing/leather handles provide a comfortable grip. Available in black and covered by Briggs & Riley signature Simple As That® lifetime warranty. In the Inside, the hide-away, leather ID tag conceals person information..